The United States Army Corps of Engineers is planning an expansion of the Ft. Carson rail yard. 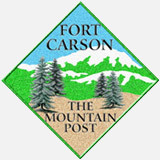 Ft. Carson is a large army post southwest of Colorado Springs. In the 1940s, Camp Carson--named for explorer and soldier Gen. Kit Carson--was started to raise Army troops for combat in World War II. Around the time nearby Camp Hale near Leadville was closed, Camp Carson became Ft. Carson. Since 2005, the post has expanded to accommodate more 4th Infantry Division troops from Ft. Hood returning from Operation Iraqi Freedom. The 4th Infantry Division is a bit of a misnomer, as the combat brigades for the division have a large share of the Army's armor, including tanks and personnel carriers. This expansion at Ft. Carson requires new capacity and upgrades from the rail yard on the north side of the fort. When a new deployment is required, the rail yard needs to be able meet the post's demand, loading the Army's equipment, including tanks, "tracks," supply trucks and Humvees quickly and efficiently. This means laying 3.25 miles of new track, including an expanded lead, spurs lengthened and upgraded to 115-lb standard and new spurs to handle deployments and other equipment moves. While most of the work will be inside the gates of Ft. Carson, expansion also means culvert work and a pedestrian bridge for nearby Stratmoor Hills Elementary School. Construction is expected to begin in the fall and wrap up a year later in early fall 2011.